Regina (which means “queen”) is the name of a local tomato variety grown in the Alto Salento between Fasano and Ostuni. Specifically, it is cultivated in the saline soils of the Coastal Dunes Regional Park from Egnazia, through Torre Canne, to Torre San Leonardo, along the Via Traiana, an ancient Roman road. The variety’s name derives from the fact that the calyx grows in the shape of a little crown. The tomatoes themselves are small (slightly larger than a cherry tomato) and round. The brackish water with which the fields near the sea are irrigated causes the tomatoes to grow a thick skin, which increases their preservability and resistance to pests. The cultivation of the regina tomato dates back to the mid-19th century, when it replaced cotton. Before this time, the just a small portion of land was set aside for tomato cultivation. Cotton, known as bambace, was cultivated in Salento beginning in the 14th century and was an important crop for local farmers: It was turned into sheets, towels, tablecloths, and garments, which women wove and embroidered at home. When America and Asia became the primary suppliers of cotton, wheat and tomatoes became the most important crops in the Alto Salento, and they occupy large areas to this day. But cotton did not disappear completely: It is used to produce the cords with which the tomatoes are tied into bunches known as ramasole. This is how the tradition of planting cotton among the rows of tomatoes was born. 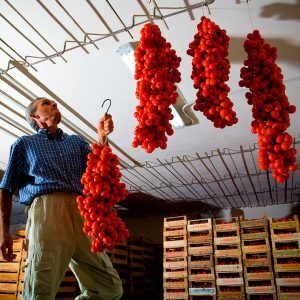 Harvest of Torre Canne Regina Tomatoes begins in July. Part of the crop is sold fresh and part is placed in boxes to dry slightly until the beginning of September, when the cotton is ready for spinning. At this point the tomatoes are tied together by the peduncle into ramasole and hung so that they may be used until the following April. At one time, having many ramasole was an expression of social prestige and family wealth, and local girls of marriageable age who owned many ramasole were especially desirable. Harvest begins in July; a portion is eaten fresh and a portion is tied into bundles with thread (made from the cotton that grows between the rows of tomatoes), which are gradually consumed until the following April. 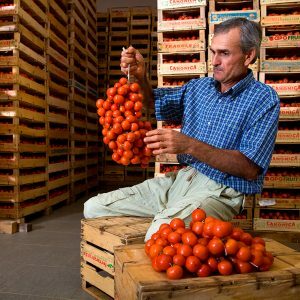 With the advent of greenhouses, which make it possible to grow tomatoes throughout the year, the cultivation of local regina tomatoes has gradually decreased. 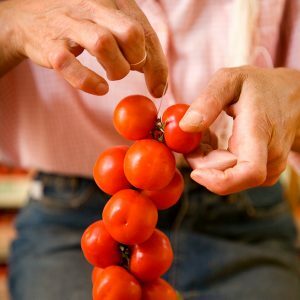 In the last 20 years, the market has become flooded with cherry tomatoes that are cheaper than regina tomatoes. But the original seeds of the regina tomatoes have been carefully preserved and reproduced each year by local families who have continued to cultivate vegetable gardens and the land under the ancient olive trees in the traditional way: The tomatoes are grown with cotton. The Coastal Dunes Regional Park, which promotes models of sustainable agriculture and the recovery of heirloom varieties, and the Presepe Vivente (“living crib”) di Pezze di Greco, which works to preserve local rural culture, supported the creation of a Presidium for the Torre Canne Regina Tomato. The Presidium safeguards and perpetuates the local tradition of growing regina tomatoes and cotton together. The tomatoes are grown with very little irrigation, according to the rules of organic cultivation, and part of the harvest is still tied into bundles with cotton thread.